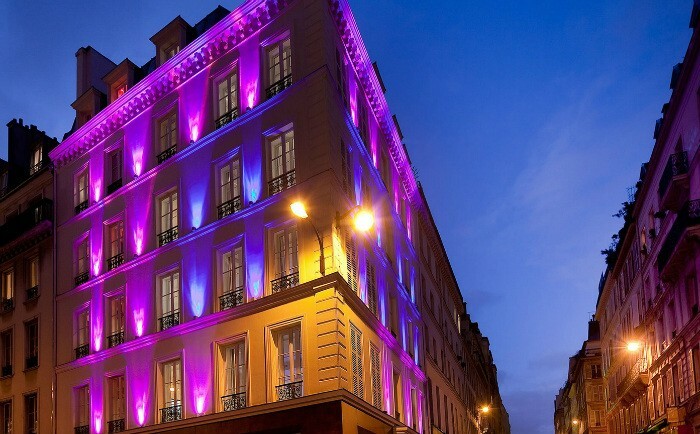 It’s bold marketing to announce yourself as “the design secret of Paris” – so I had some nagging doubts before my stay at this boutique hotel in the Trinité quartier, in the 9th arrondissement, simply based on high expectations often failing to deliver. I needn’t have worried. This is a cute little boutique hotel in an old corner town house located quite conveniently near the Place de Clichy and Liège métros, and an eight-minute walk to the Moulin Rouge. Speaking of Moulin Rouge, if you’re a big fan why not ask for one of the Moulin Rouge themed rooms? They’re decked out in red drapes with can-can girl posters and a windmill backdrop. That seemed too much like a romantic love-nest for my business trip so I opted instead for the Eiffel Tower theme and was rewarded with a very comfortable room which came with a kind of 3D view effect behind the bed – a faux steel girder straddled the walls in front of distant views of Paris. It’s hard to describe and probably sounds slightly tacky but actually it was kind of fun and because everything is well maintained and the furnishings are good quality it doesn’t feel Disneyfied. 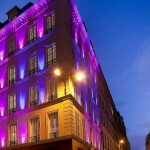 Other themed rooms include the Musée d’Orsay, the Trocadéro, Opera Garnier and Ateliers d’artiste, set appropriately on the top floor up in the eaves. The whole design effect is complemented by mood lighting in the bedroom and shower room (and bathrooms come with chromotherapy tubs). For this is really the secret of the hotel: the design. It’s not unusual to find a themed boutique hotel but here they have gone to a great deal of trouble to work the witty design philosophy into almost every element – from the themed rooms right through to the carpets and library area in the pleasantly light and comfortable lounge/breakfast area on the ground floor. 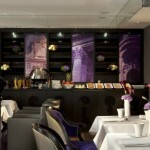 Breakfast costs extra but good quality with a nice selection on offer and pleasant staff. Down in the basement they have a garden-inspired Hammam and Fitness area, which is unusual in small boutique hotels. Rooms are on the compact side (but not unusual for central Paris), beds are comfortable, and bathrooms are well-appointed with high quality fittings, rain-showers, marble basins, bathrobes and toiletries. I found all the staff to be very friendly, helpful ,and keen to recommend local transport or eating places. So it just goes to show: you should not pre-judge a book by its cover or a hotel by its name. The secret turns out to be not just the fun approach to design, but also the fact that here you have a great little hotel that delivers on all its promises. What’s more, it’s a convenient location and room start from 175 Euros per night. 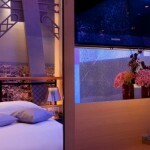 Hotel Design Secret de Paris, 2 Rue de Parme, 75009 Paris. [email protected]. Tel: +33 (0)1 53 16 33 33. 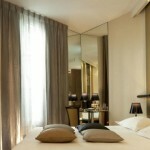 Rooms start from 175 euros per night.